When you hear the words “man’s best friend”, the first thought happens to be a dog. They are a part of many peoples lives and are even a part of their family. They are treated well and given access to your house, beds, food and more. 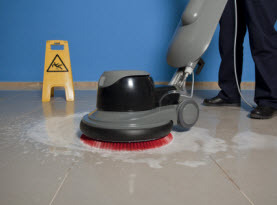 They are a great addition to a household but can be taxing on your carpets. 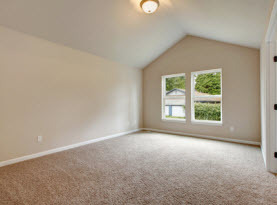 The carpets take a beating that includes high traffic areas, stains, spots and dirt build up. 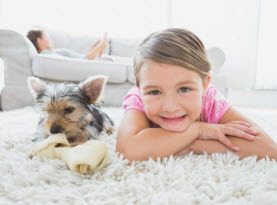 Now when you add a four legged friend to the mix the amount of trauma that your carpets go through increases. It is a good idea to know how to deal with the messes that are most common when you have a dog. Pet Hair & Dander: One of the problems that come with a dog is that they have pet hair and dander. The dog has hair that they shed and because they don’t brush themselves it seems to land all over the house. This includes on your carpets. They best thing you can do for the hair and the dander that you will have all over your house is to run your vacuum. The vacuum is a great way to reduce the amount of hair and dander that is on your carpets by sucking it up. Be sure that you empty out the canister regularly. You can also make sure that your dog is brushed and bathed regularly to reduce the amount of shedding. When you have your carpets cleaned professionally it can help to remove the hair and dander that is set deeper in the carpet fibers. Dog Urine & Feces: Most dogs will end up being potty trained to ensure that they use the bathroom outdoors. Until that time they tend to have accidents that always seem to appear on your carpets. Even after they are potty trained they will have times that they can’t hold it and another accident will happen. These are some of the biggest problems for homeowners because the urine and feces will leave an odor that stays even after the stain has been removed. The odor is something that can linger which is why you need to clean stains as soon as possible. You can also have your carpets cleaned professionally which will take away the odor and any remaining stains. Dirt & Mud on Carpet: Lastly no matter how often you give your dog a bath they will bring dirt in the house. After they go out for a walk or a bathroom break they will come back in the house and on the carpet with dirt on their paws. They leave this dirt on the carpets and you will be left cleaning it all up. Dirt is something that can actually cause the carpet fibers to collapse and get smashed leaving them flat and lifeless. 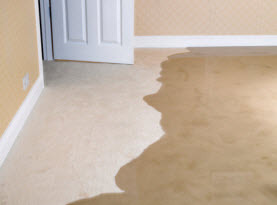 CA Carpet Cleaning & Water Damage Clean Up offers cleaning services to remove pet stains and odor. Call us today to have your carpets cleaned.